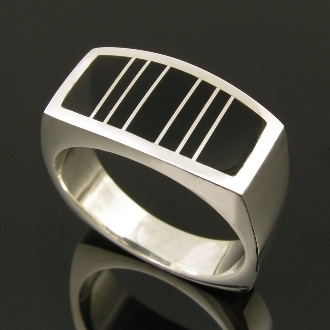 Our Products >> Man's handmade sterling silver ring inlaid with black onyx. Contemporary sterling silver man's ring inlaid with black onyx by jewelry artisan Mark Hileman. This black onyx ring is square shanked for a more contemporary design and to resist turning on the finger. It is inlaid with 7 pieces of black onyx but can be inlaid with other materials by special order. The ring measures 11mm wide and is shown in a size 10 1/2 for scale. This ring will be made to order in your ring size in 4 to 6 weeks. We recommend upgrading to Continuum silver for all daily or heavy wear rings. Continuum silver is much more durable than sterling silver and is also tarnish resistant. Here is a link to read more or order this upgrade.